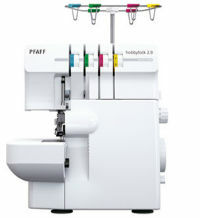 This machine will help you sew like a pro! Capabilities include 5 threads, LCD Graphic Touch Screen and a large variety of stitches. 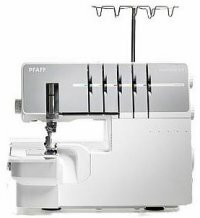 The PFAFF® coverlock™ 4.0 overlock machine has an ultra-modern design that offers convenience and a huge variety of stitches to inspire more creativity. Everyone will think you're a sewing pro when you create your projects with this versatile machine featuring 5 thread capability, unbelievable sewing space, the professional cover stitch and so much more! Sew, trim and hem in a single step for a professional finish. Additionally, create exclusive accents with decorative stitches! 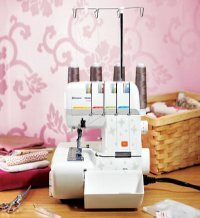 Sewing like a pro is no problem with this terrific serger that comes with a wide variety of features and stitches! 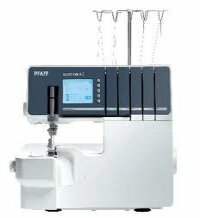 The Hobbylock 2.0 machine is an easy-to-use, modern overlock that has many practical features including: 15 stitches, adjustable stitch length, builtin rolled edge, free-arm for sewing sleeves and pant legs, electronic speed control, and much more. This machine is the secret to fast, sturdy and stunning seams. The Husqvarna Viking H|Class 200S features impressive speed and intuitive threading for seriously incredible results. Give all of your sewing projects a professional finish!